It's sneaky peek time for Your Next Stamp! As it is with every month's release, you will just want one of everything! For my sneaky peek, I am using the new set of 'tini Sips. I just love this set! I stamped the lemons throughout the top panel and popped up the martini glass over the Scallop Circle die cut out. Using the Talk Bubble dies, I stamped the sentiment with some YNS Gray Stone ink and popped that up near the glass. Because don't all drinks talk? 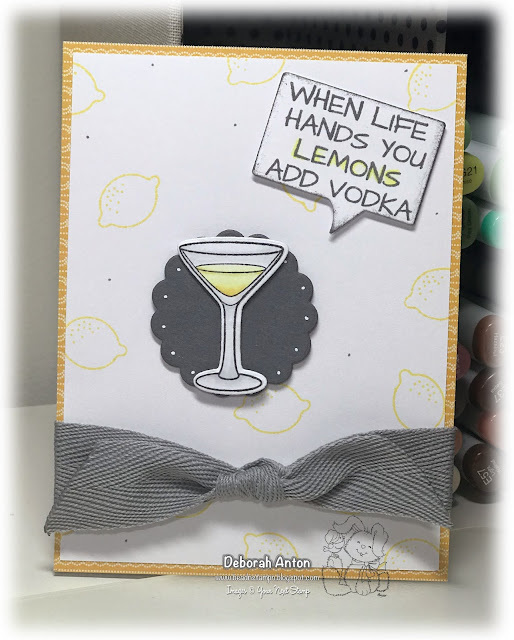 :) I finished the card with some ribbon and added some gray dots throughout. Although, once I started, I sort of wished I didn't. Oh well, it makes for some character. Be sure to check out all the YNS DT Sneaks on the blog and come back tonight for the release and blog hop! Thanks for stopping by! Such a great sentiment and cute card! Lovely colour palette on this card. Thanks for sharing your creativity. I always add vodka, lol! This is fun!